Russian President Vladimir Putin said Friday that he has decided not to expel American diplomats from his country. Russia’s foreign minister had suggested expelling United States diplomats and other measures to answer U.S. sanctions against Russia. On Thursday, President Barack Obama ordered 35 Russians to be expelled from the United States and other measures. The moves came after U.S. intelligence agencies said Russia hacked Democratic Party computers and released stolen emails. The agencies said this was done to interfere with the U.S. presidential election. Putin said Russia “has reasons” to take action against the U.S. 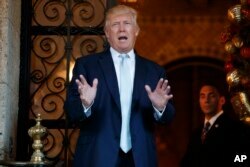 But he said he will wait to “plan out further steps” based on the policies of the incoming administration. Republican Donald Trump will replace Democrat Barack Obama as president on January 20. The Russian officials were ordered to leave the country within 72 hours. In addition, Obama ordered the closing of two Russian properties inside the U.S. He also ordered sanctions against nine Russian individuals, companies and agencies, including the Russian intelligence service. “All Americans should be alarmed by Russia’s actions,” Obama said in a statement. He said the “theft” of computer emails and other data, and their release through WikiLeaks, were done to “interfere” with the 2016 U.S. election. A senior Obama administration official said the United States believes Russia “will continue to interfere” with elections in other countries” and in future U.S. elections. Trump added: “Nevertheless, in the interest of our country and its great people, I will meet with leaders of the intelligence community next week in order to be updated on the facts of this situation." When Trump becomes president, he could move to cancel the sanctions ordered by Obama. But he might find opposition from Republicans in Congress who have called for punishments against Putin and his government. Donald Trump speaking to reporters. Putin’s decision not to take action against the new U.S. sanctions came as a surprise. Just hours before Putin’s announcement, Russian Foreign Minister Sergey Lavrov suggested Russia would remove 31 American diplomats and take other action. Putin said he decided against any actions -- for now. Putin said he is inviting all children of U.S. diplomats to holiday parties at the Kremlin. Dmitry Trenin is director of the Carnegie Moscow Center. Trenin said Putin’s decision not to act against the U.S. sanctions appears to be an “investment” in the possibility of better relations with President-elect Donald Trump. Trenin made his comment on Twitter. Daniel Schearf reported on this story for VOANews.com. Bruce Alpert adapted this story for Learning English and did additional reporting. Mario Ritter was the editor.